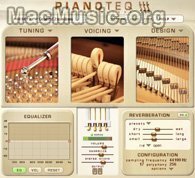 Are you interested by a Pianoteq license ? Well, Modartt has just launched a contest, open for everybody, where there will be 3 winners, each receiving a license of Pianoteq. Note that if you already own a license, you will be offered a free upgrade to a forthcoming product ! And what is the contest about ? In an audio file, you will hear a medley of classical piano works by famous composers. Tell them which composers you can hear in this medley. If you manage to recognize all of them, in the correct order, you will participate in the lottery of 3 Pianoteq licenses. The lottery will take place on May 31 which is the last day to participate. There are a total of 10 excerpts of piano works by 10 composers. Some may be piano transcriptions of orchestral works, some may be easily recognized, others may be a challenge. Credits will be given to the performers when announcing the winners, together with a description of each work.